Also see this comic strip in Spanish. Have you been there? 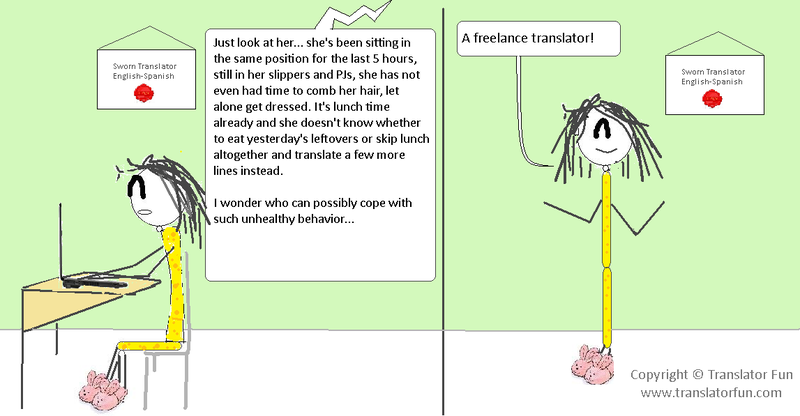 Do you think that this is an accurate description of a day in a freelance translator’s life? Is it a myth or an exaggeration maybe? Is there some truth in this description? This entry was posted in Freelance translator, Fun, lifestyle, Translation and tagged freelance translator, freelancer, habits, humor, lifestyle, sworn translator, translation, translation business by Romina Bona. Bookmark the permalink. Romina what wonderful observations! Nadie cree lo que hacemos los traductores ni las exigencias de tener siempre trabajos urgentes. Un abrazo desde Australia … las condiciones son iguales en todo el mundo. Mil gracias por distraerme un rato y hacerme reir!! And I can’t stop myself from correcting other people’s grammar either. I had to laugh, this is so true!!! Why on earth have you been spying on me! Very true!!!!!!!!. It seems we are all in “The same boat”. Hahaha it so true!! Awesome blog – congrats!